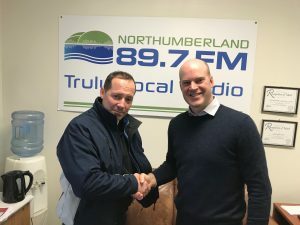 Please join me on Thursday, November 29th at noon on Northumberland 89.7 FM Small Town Radio for the next episode of my radio show Business Insights with John Racine. My Guest this week is Darren Johns, owner and operator of Mercury Chocolates & Gelateria &Tuscany Food & Wine Tours located on John St. in downtown Port Hope. Darren has an interesting start into the culinary world. As an apprentice in the CP hotel program he learned a lot of the skills that he has carried with him throughout his career. We were able to discover what it really meant to be an entrepreneur in the food services industry in the early 2000’s. Darren shares with us what inspired him to open a “chocolate shop”. I hope you enjoy the show as much as we did recording it. As always, the show will be available by podcast, so stay tuned!